麥兜自幼跟隨母親麥太學習捲腹。一歲起即在各 地公開表演咬蛋卷、卷蛋、法國田螺以及 雞絲粉卷。今年麥兜將作出個人最大突破， 與香港小交響樂團合作，演繹他的最新作品， 《捲腹咬燒腩卷》（世界首演）。 McDull trained for crunches under his mother. At the age of one, he started performing the art of crunching spring-roll, Swiss roll, escargots à la bourguignonne and shredded chicken roll. This year is McDull’s breakthrough! 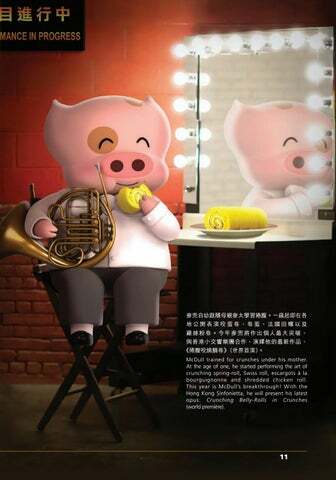 With the Hong Kong Sinfonietta, he will present his latest opus: Crunching Belly-Rolls in Crunches (world première).